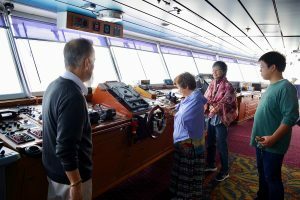 The control room of the ship is called the “bridge”. The word originates from the fact that arched bridges are placed from the left and right edges of the hull that overlooks the entire ship. It is a special place that you can not usually enter, but today, with the permission of the captain we held a tour of the bridge. A long line of excited participants waiting at reception can be heard saying “I wonder what kind of place it is?” and “I’ve seen it in movies but it is amazing that we can actually go in!” Finally we head to the bridge of the Ocean Dream! In a room with a panoramic view overlooking the horizon, many machines that we have never seen are lined up in a row. The ship’s bridge is a place full of curiosity and mystery like a spacecraft. The latest GPS (global positioning system) is able to help locate small vessels in the surrounding area and the screen also shows the vessel’s name. Currently, the most advanced electronic charts are used as the nautical charts for the voyage. “In the past, we had to search frantically for the chart in the drawers. 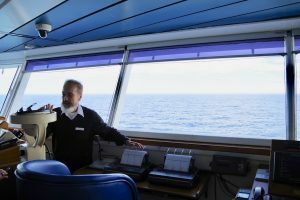 Now all you have to do is search for the map you need and it will come up on the display, it is a lot easier,” a crew member says as they chuckle. Many of the curious looking equipment in the bridge prompted many questions from the participants, overall the tour was a great success. “Let’s steer the ship!” says a crew member as the participants listen doubtful that it is true. However, there is no need to worry. During this time of day, the ship is on autopilot and you are not able to steer the ship by moving the wheel. Standing and gripping the wheel while looking at the sea reminds us that we are traversing the middle of the ocean. 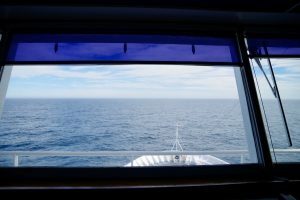 For those of us traveling around the world on the Ocean Dream, this was a very special experience that made the boat trip even more enjoyable.